Bats in the category of Megabats have a diet focused on fruit. It's not by accident their vegetarian taste has not stunted their growth. Some of these bats weigh two and a half pounds and have a six-foot wingspan! Meanwhile smaller bats (Microbats) eat mainly insects, and the very smallest among them weigh less than a penny and are about the size of a jellybean! But all bats are mammals belonging to the order of Chiroptera meaning "hand wings." The name comes from the wing's design, with a framework that looks like greatly elongated human finger bones. Yet bats' wings are much stronger, and more flexible! The webbing membrane, like the fabric of an umbrella, is attached to the back and legs of the bat, and feels like soft velvety skin. Those wings are very delicate, yet quite maneuverable, and of lighter weight than a bird's wings! So it's not by accident that a little microbat has been clocked flying at speeds up to 50 mph pursuing insects! It definitely has "airfoil"! While some mammals glide, the bat is the only mammal actually capable of true, sustained flight—flapping its webbed digits and propelling itself forward, then, not by accident, folding its wings, for a directional change. Their easily ripped wings have the God-given not by accident ability to regrowl There is high-tech info involved in their flight, too! Within the wing surface there are "Merkel" cells or bumps, and from each bump grows a single strand of sensitive hair—like an antenna good for measuring wind direction and speed then adjusting the shape of the wing in order to fly more efficiently! Microbats (the insect-consumers) hunt at night—sometimes in the pitch darkness of a cave where they have hung by their tails, upside down, all day! But their Designer kept their blood from rushing to their brains: First, the heart, not by accident, pumps blood toward the extremities. Then He placed not-by-acciderrt valves-into their deesign that close the return entrance of blood in both the veins and the arteries! Other amazing not-by-accident gifts involve their hearing and sound emissions as they search out prey, often making chirps and yells at such high decibels their communications go well beyond human access. Their "FM signal system" is called echolocation. 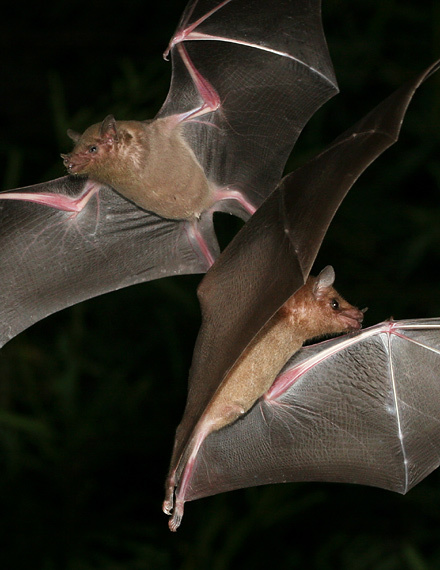 These bats send out sounds while hanging, or flying, or wherever they happen to be. The signal sent (as humans learn with their sonar and radar), will bounce back. For the bat, the angle of the signal returning tells all about the object ahead: it's distance, whether it is moving and how fast and in what direction. They know if it's a rock, insect, person, or plant—and they need no electronic viewing equipment for instant interpretation! The bat's mechanism for sending the sounds at times comes from its nostrils, if the bat's mouth happens to be full, since they might grab prey with their teeth and eat as they fly! Their noses may not seem too attractive with nasal flaps that are used to control the delivery or blocking of sounds—but those flaps are very practical and protective. And the inner ears of bats, where the hearing is done, are also enabled to make adjustments, with well-placed ridges so they can be shut when more protection is needed to close off the loudest sounds! Returning sounds, not by accident, often come in on a different frequency for clarity! (It's called "FM" by humans, and am told not even our radar and sonar manages to do that!) It's quite "high-tech" to some of us, but simply another not-by-accident design by the Master Engineer—our Creator! Intelligent Design or Random Chaos? "A lazy man buries his hand in the bowel, and will not so much as bring it to his month again."